During my summer quest to slim down and be healthier, I have tried to go beyond my comfort zone and recently began looking for protein shakes to try. I always thought that protein shakes were only for guys, especially those who eat raw eggs for breakfast and bench a thousand pounds. But, to my surprise, protein shakes can actually be really beneficial for girls, too, given you consume the right kind with the right ingredients. As you may already know, protein can be consumed for muscle mass, but it can also be beneficial for weight loss. 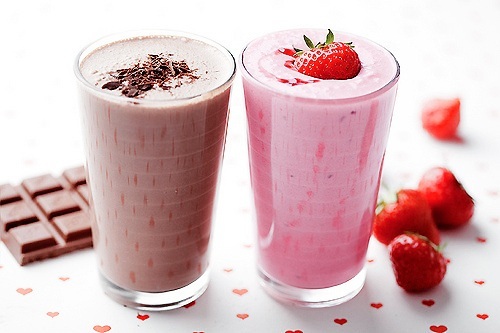 Protein shakes in a diet are supposed to be consumed like food— as a meal replacement for less than 300 calories, and they can really help fulfill your weight loss goals. Especially with ingredients that help sustain energy levels better than carbs do like soy (antioxidant-like qualities) and casein (slow-absorbing and can keep you from getting hungry too soon), protein shakes are really gaining popularity even among young women. I was interested in post-workout shakes and found that protein shakes are really great for nourishment right after a tough workout. They allow the body to recover by restoring muscle glycogen, which fuels your body and depletes during a workout. In addition, shakes can help sustain energy levels. Those who exercise regularly need more energy than those who don’t, so those who do exercise regularly can really benefit from protein shakes. Whey is a key ingredient in post-workout shakes, and it is fast absorbing, which is important for your body when it needs its protein fast in its post-workout or catabolic state. In addition, whey protein helps decrease recovery time after a workout and quickens muscle repair, keeping you in good shape before your next workout. Whey protein also is really good for the vegetarians out there. Increased levels of protein are necessary for those who don’t eat meat, especially if you’re trying to get in shape or take your fitness to the next level. If you’re interested in what protein shakes can do for you, consider looking at your local GNC or Nutrishop (my personal favorite!) for a protein powder that’s best for your exercise regimen and lifestyle.